Citrine Natural Health Blog - Useful tips and educational information to help you maintain a healthy lifestyle. Just a quick organic produce buying tip. I do believe that local and organic fruits and vegetables are the way to go, supporting both our bodies as well as smart farming practices. We've gotta be gentle to our lovely Earth! She's the only one we've got and how much do we love our lake-dips, summer breezes, afternoon storms and ocean swells? BUT, 100% organic can also be pretty tough on your wallet. 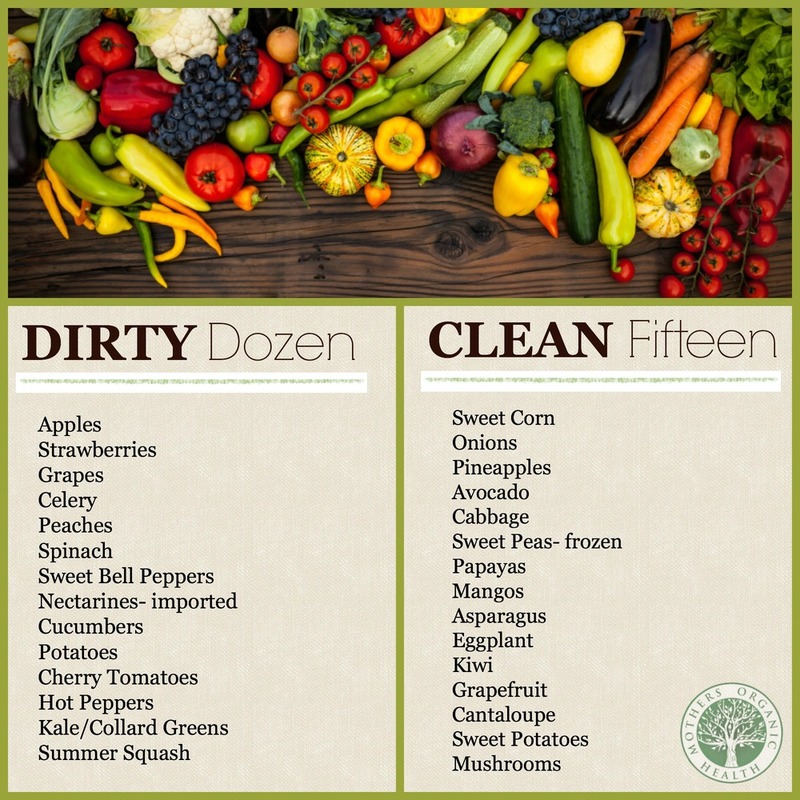 Below is the "Dirty Dozen" food list which is produce that holds on to a lot of pesticides or takes a lot of pesticides to grow and it's a good idea to seek out organic. On the other hand, there is the "Clean Fifteen" foods that have the tendency to hold on to less pesticides, or need less pesticides in growing, so they are a little safer to buy non-organic if needed. P.S. Future posts coming about how to easily grow some of your own organic produce in your backyard, which "feeds many birds with one seed" (trying not to say "kills 2 birds with one stone" anymore...MEAN.) Simple gardening covers the bases; being nice to the Earth, getting you outside and cutting back on expenses (Oh, and nothing tastes better than home-grown). Don't worry, we'll start simple. Until then…I'm focusing on slowing down and making sure to breathe in all of the wonderful bits about living in the great Pacific Northwest. You get all of the health benefits of soaking in mineral-ritch waters all while grounding out and relaxing in nature. Google-search springs in your area. Overfed and undernourished? Our food becomes our body and soul. -Analisa, Doctorate of Naturopathic Medicine in 2 months! This week I read about new insight in to why babies get sick frequently. They may actually be suppressing their immune systems, and not fighting off every little cold, in order to allow beneficial gut bacteria to grow. So, this post is focused on "Probiotics." What's all the hype about anyway? "Probiotics" definition by WHO (World Health Organization): "Live microorganisms which when administered in adequate amount confer a health benefit on the host." Where can you find these beneficial critters? Yogurt, Saurkraut, Kombucha, Miso, Kimchi and Kefir! What can throw our gut probiotics out of whack? All sorts of things including antibiotics, spermicides, stress and birth control pills. Here is another NPR article about colicky babies and probiotics. What is a superfood anyway? The term "Superfood" is used to describe a food with high nutrient or phytochemical content that may offer health benefits. Phytochemicals are chemicals or compounds that plants produce. True or False? Superfoods are expensive items only in found in health food stores and are usually shipped from rural areas in distant countries? You can find superfoods in every environment and most small-town grocery stores across the planet. *Tip: Look for rich or bright colors that may stain your hands or cutting board...that's when you know it's the good stuff. The Oregon Fall salmon run. Photo taken by Keith Novosel on a recent fishing trip.